“I decided not to renew. The contract ended, and I think that it’s time for a new beginning for Room 101. I am grateful for the years of partnership and support from Davidoff,” Booth said when he announced what would be just a six-month hiatus from the cigar industry in January 2017. Sure enough, in July 2017, Booth announced he was back and collaborating with Robert Caldwell on two new cigars. The first of the two was Hit and Run, made in the Dominican Republic. The other is The T., a collaboration between A.J. Fernandez, Robert Caldwell, and Matt Booth. 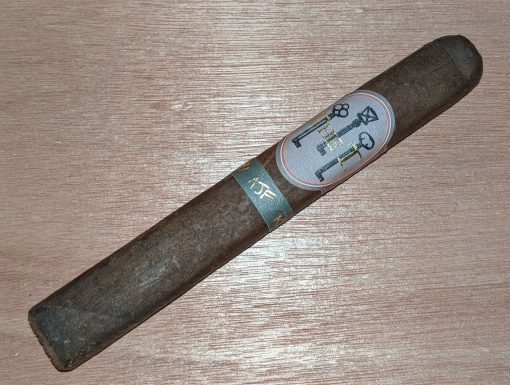 Originally called The Truth, this collaboration was renamed after a copyright issue, presumably with Tatuaje (which makes a vintage cigar called La Verite, French for “the truth”), not with those gaudy propagandists at TheTruth.com. The T. comes in 5 box-pressed sizes, including the 6-inch, 52-ring gauge Toro ($11.50). The cigar is a Nicaraguan puro made at Tabacalera A.J. Fernandez Cigars de Nicaragua S.A. It is well-constructed and firm to the touch with a dark, oily wrapper. Combustion is excellent, with a sturdy ash, easy draw, and even burn. Once lit, the cigar features roasted cashews and black coffee notes, combined with leather and clove. It’s medium- to full-bodied with some slight tannic dryness. As the cigar evolves, charred oak, barnyard, and light black pepper notes emerge. Different from most A.J. Fernandez-made Nicaraguan puros, but still an enjoyable cigar. I didn’t particularly enjoy Caldwell and Booth’s Hit and Run collaboration, but this cigar hits my palate in the right way. Good construction and satisfying flavors earn this collaboration a rating of four stogies out of five. One of the best cigars I’ve ever had, and I’ve had a lot. Absolutely delicious combo of sweet coa coa, tobacco, pepper spice, and a buttery sugar cookie with a cooking herb note I can’t quite put my finger on yet. A wonderful full body smoke, you won’t be disappointed.